As many of you might have seen recently on the OFNC Facebook page, web site, and Trail & Landscape, I was (and still am) looking for snake hibernating sites (called hibernacula) around the National Capital Region. I received great feedback from this call-out. I learned of six potential communal hibernating sites (places where multiple snakes hibernate), as well as one location where a snake was hibernating under someone’s pool. This was far more feedback than I had expected, and I am grateful to all of the OFNC members who provided information. Now you may be wondering why I am interested in finding snake hibernating sites. 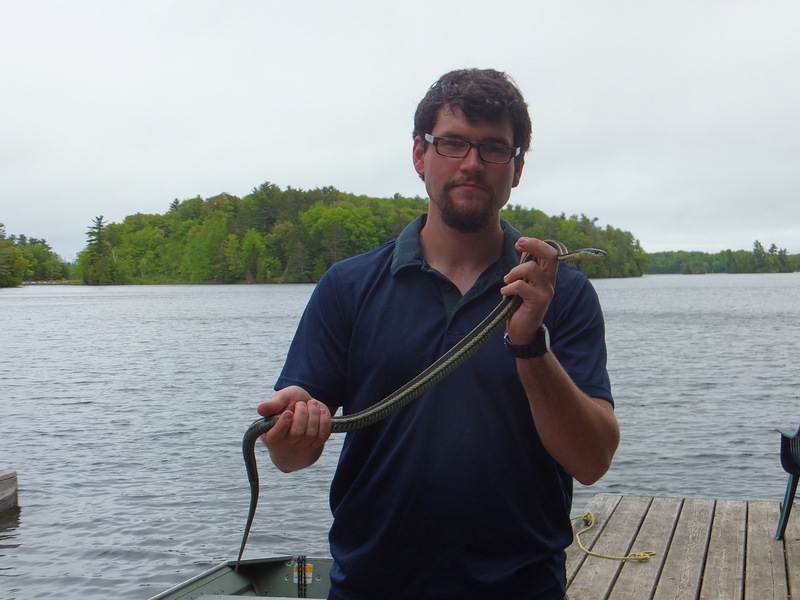 As part of my PhD research at the University of Ottawa, I am studying habitat selection behaviour of snakes. One aspect of habitat selection is finding a good hibernating site. Snakes have to take many factors into account when choosing a hibernating site, but the most important factor is access to an area that is below the frost line during winter. Snakes attempt to keep their body temperature at 4°C, and hibernating above the frost line causes them to freeze and die. Other factors that can make or break a good snake home include exposure, tree cover, and moisture content of the soil. Typically, snakes like moist (but not flooded) sites with few trees and a southern exposure, because they require humidity while hibernating and basking opportunities before and after hibernating. I have been focusing on eastern garter snakes because they are abundant, but I am collecting data on any and all snake species that I find. This summer as part of my research, I collected habitat selection data on eastern garter snakes, eastern ribbon snakes, northern redbelly snakes, midland brown snakes, eastern milk snakes, northern water snakes, and black rat snakes. Most of these were located near the Queen’s University Biological Station, but many redbelly snakes, a few garter snakes, one milk snake, and one water snake were around the National Capital Region. Following hours of observation, I found that in the summer most snakes prefer open, sunny habitats that allow them to maintain a high body temperature. Interestingly, I found many garter snakes under tree cover on the shaded north side of a hibernating site this fall, opposite to what we expect to see based on previous studies.All of the snakes I encounter exhibit interesting behaviour, including basking and defensive coiling. Some even shake their tails in the leaves to mimic rattlesnakes, even though they are non-venomous. These practices make them fascinating animals to study. Many of these species are also of important conservation concern, which makes it crucial to understand their behaviour and habitat preferences. 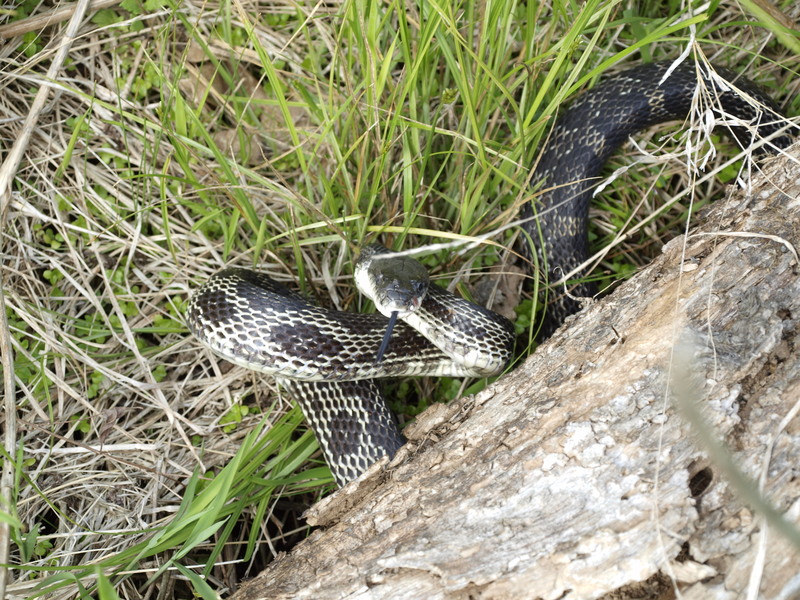 My work with snakes continues around the National Capital Region for the next 2-3 summers. Stay tuned for more highlights on my snake habitat selection research.